Over 3 years ago, I had Blue Bunny ice cream for the very first time. The blog was just two months old and I was a cranky, unsophisticated little spoon at the time because I was not nice to Super Chunky Cookie Dough at all. I don't know what I was thinking back then, but man, this stuff is good. Well, I got hungry Wednesday night and suddenly had the urge for cookie dough. I cracked the container open. Is that a saucey cookie dough swirl I see? I take a bite and it is a sinfully sweet cookie dough sugar rush. It's borderline too sweet, but it's riding that line with a taste that is making me scoop for more. Ohhh man, just give me mug of this stuff and I'll be happy (and quite possibly delirious). Next I start aiming for the cookie dough bits. Sure, they look fairly standard in the penny test, but the secret here is a wonderful crunch factor. The center of the bit has a butter cookie like crunch that sets it apart from any other cookie dough bit I've ever had. How did I not notice this before? Talk about adding just a touch of crunch, very cool. My question now is how did they make it. Is it a small bit of cookie wrapped inside cookie dough? I just don't know, but I like it! Oh, there's one more thing that I need to point out. My big complaint before was a butter like taste to the ice cream but now I don't even notice it. Not on the first scoop, and not even on the larger second scoop. Part of me wonders if maybe I got a container that was a little off last time? I mean I don't even remember seeing the swirl before. It's that, or maybe my tastebuds have matured? I don't know what it was, but Blue Bunny has definitely come out with a unique cookie dough flavor here. Awesome job. This looks really good! Maybe Blue Bunny tweaked it a bit since the last time you had it. I agree with you so much on this ice cream. I'm happy that this part of the slim offerings of blue bunny in my area even if it only comes in the personals size. That almost might be a blessing seeing I'd want to devour a lot of it at once given the opportunity. I really wish I could find bluebunny personals in my area. @Nick: ha, I was having trouble scooping the bowl without eating every other bite. @Rodzilla: yeah, they have very inconsistant offerings around here, but at least I have some choices! my area just got personals and nothing else. We've just had their basic ice cream sandwiches until we got the personals. So hopefully this is a sign my area will realize how good blue bunny is. Mm... that looks so good! I'd definitely try it, but I can't seem to find Blue Bunny anywhere near me! Ahhh this looks amazing..and the cookie dough pieces look so big and satisfying! ice cream sit out on the counter 20-30 mins. then begin to eat it slowly then all of a sudden there it is this Amazing Cookie Dough Batter Ribbon soft & so SWEET it's additive!!!! Someone else said just give me a Mug of the Cookie Dough Batter Ribbon. They need to put more of that in the ice cream, then again maybe not!!! because when I find it I stock up!!!! ADDITIVE!! I have come close to eating a whole 1/2 gallon in one sitting. I never use a boul. I just wrap a towel around it & enjoy!!! @Mike: that's just wrong that you cant always find it. The selection in my area is limited, but Walmart always has this in stock in my area. The ooey gooey swirl is a very unique feature compared to most cookie dough varieties. @Mark: a totally different beast, mainstream 1.5 quart container vs a premium pint. I would give it a shot, but please don't expect an apples to apples type product. This version is very sweet, I will give it that! Don't do it! Not for now at least. Blue Bunny made huge changes to this product this spring. The dough goo is more of a caramel, the cookie dough is dry balls that turn to a powdery grainy texture in your mouth. 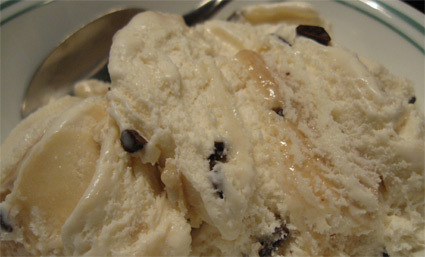 Also the ice cream itself is grainy. What happened? I don't know but its no longer the ice cream my wife and I had to each have our personal container so we didn't fight over who got the goo. Please Blue Bunny bring back the good recipe!! Sorry for the bad experience, but let me make two points. One, sounds like you got a freezer burned container, and I say this because of point two: we're actually enjoying the upgraded version. We've bought 8-10 of them now and the swirl is kind of evilly delicious. I can see some people saying it's too potent, but they've amped up the brown sugar factor in that swirl and it's addicting to someone like me. Yes, the base is a little different, but it's not crazy grainy nor are the chunks. I really do believe you got a bum container. 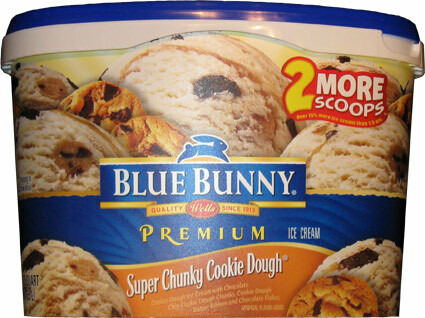 I use to love the Cookie Dough Ice cream. Now there are not as many cookie dough balls in the batter as there use to be. What a shame!My husband and I would rather go to Cold Stone Ice cream and pay more to get our Ice Cream the way we want it Why try to fix something that isn't broken. Nah, I should've listened to Mr. Muford, this ice cream was infuriating because I was basically lied to. First of all, there was ZERO cookie dough or brown sugar flavor in the base. The base ice cream was WHITE and tasted like McFlurry mixed with Cool Whip. I know that cheap soft serve texture is typical of new Blue Bunny, and some people like it. I would've been okay with it, if it just simply tasted like brown sugar and was the color of the ice cream in these pictures. The batter swirls were NOT throughout the ice cream, they were smeared on the inside of the see-through container, so a sucker like me would buy it. Then again, the so-called batter swirls were actually gross. They tasted like toffee with imitation butter. So maybe it's a good thing they weren't actually in the ice cream. The only thing they got right, was the actual cookie chunks, which were not in the base enough. I fished out as many ice-cream surrounded dough bites as I could manage and through out the rest. hope they can make some changes and go back to the 2011-2014 years. If I sound overly bitter, it's because I am. I went over my budget at Wal-mart, and had take a few items off my order. This should've been one of them.